Most people know the ketogenic diet can help with weight loss, but did you know you can actually build muscle too? Is keto bodybuilding legit? Let us introduce you to Robert Sikes, AKA Keto Savage, a lifetime natural competitive keto bodybuilder. Using the ketogenic diet, he has seen consistent gains in building lean muscle mass, finding it to be much less stressful on the body than bulking and cutting the traditional way with carbs. Robert Sikes went from a 115-pound kid in high school to 230 pounds in college and started competing in 2010. A few years ago he began transitioning to a keto bodybuilding approach and found that his body recovered faster after competitions and that the ketogenic diet provided a much more sustainable and healthier way to building lean muscle. When not training, you can find Robert providing online coaching through his company Keto Savage. He and the love of his life, also a phenomenal keto competitive bodybuilder, Crystal Love (and also a keto coach), founded Keto Brick, a 1,000-calorie meal replacement bar that meets all the keto macros for anyone actively training, running, hunting, mountain biking, backpacking, and more. (Be sure to sign up on their list as these keto bars sell out like hot cakes!) 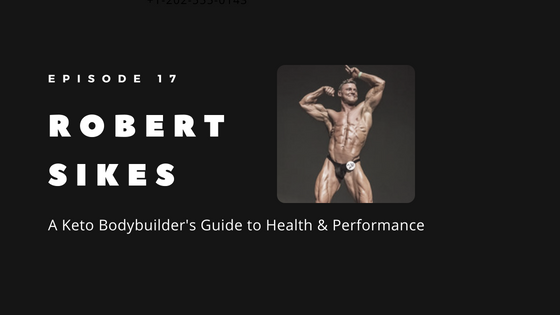 Robert believes that anyone can achieve the same physical success that he has if they are willing to invest the time, effort, and dedication in their diet and fitness. Take the next step and learn more about his new 90-day comprehensive program with KetoConnect’s Matt and Megha: Deeper State Keto. You can also catch the awesome Keto Savage podcasts here. Listen to our podcast in iTunes! This podcast is brought to you by Heads Up Health, a web app designed to help you centrally track all of your vital health data. Instantly synchronize your medical records, connect your favorite health devices like MyFitnessPal, the Oura Ring and other apps and use your data to optimize your health!